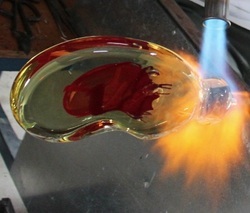 We offer a variety of workshops that allow people to learn about and experience the glass making process. Both Emma and Mark are currently completing their Master of Teaching and are registered as teachers with the Victorian Institute of Teaching. We offer a variety of courses in glassblowing and kiln forming techniques. We can also tailor courses to your specific requirements.